During the 1970’s fishermen made the observation that the Atlantic sea scallop was becoming hard to find. Overfishing had depleted the numbers and they were not repopulating at a steady rate. In the early 1980’s after noticing that nature wasn’t going to be able to keep up with man’s demands of the scallop, programs were set up to monitor the scallop fishing industry and to also set catch limits. In 1997 NOAA and the New England Fishery Management Council determined that the Atlantic sea scallops were still being overfished and by 1998 a new plan for allowing the scallop to increase their numbers was implemented. The guidelines for fishermen proved to be useful and the scallop industry had great success. It was reported that the scallop biomass harvested had increased eighteen times higher than the previous level between 1994 – 2005. The demand for the Atlantic sea scallop did not decrease. The sea scallop adductor muscle, the muscle that holds the two shells together and allows the animal to open and close the two shells, is harvested for food. The muscle is typically 30 – 40 mm in diameter in adult sea scallops. The demand for this tasty muscle has made the Atlantic sea scallop fishing industry into a very powerful and prosperous billion-dollar industry. Fisherman will agree that science is essential to the health of their industry. It was determined that rotational management was needed for the scallops to replenish, much like crop rotation on land. After a period of time, areas need to rest without any activity and other areas can be reopened to scallop fishing after a period of time. What that time period for rest is and what areas need to rest while other areas are opened to fishing is the science behind the industry. The industry recognizes that the science is essential to keep a healthy population of Atlantic sea scallops and, through a special research set-aside program, invests 25% of the scallops to research. The market value of the scallop, usually $10 -$14 per pound, determines the funding scientists can invest into research. Resource management is not a new idea. Resources are managed at all levels whether they are animals such as scallops or deer, minerals or elements mined such as aluminum or coal, or even plants such as trees. Without management practices in place, there is a good possibility of endangering the resource for later use, and in the case of living animals, endanger their future viability. Some of the “Research Set-Aside” monies given by the commercial fisherman have allowed the development of a special habitat mapping camera, affectionately called the HabCam. Dr. Scott Gallager has combined his two areas of expertise, biology and electronics and developed a series of cameras used for studying underwater habitats. 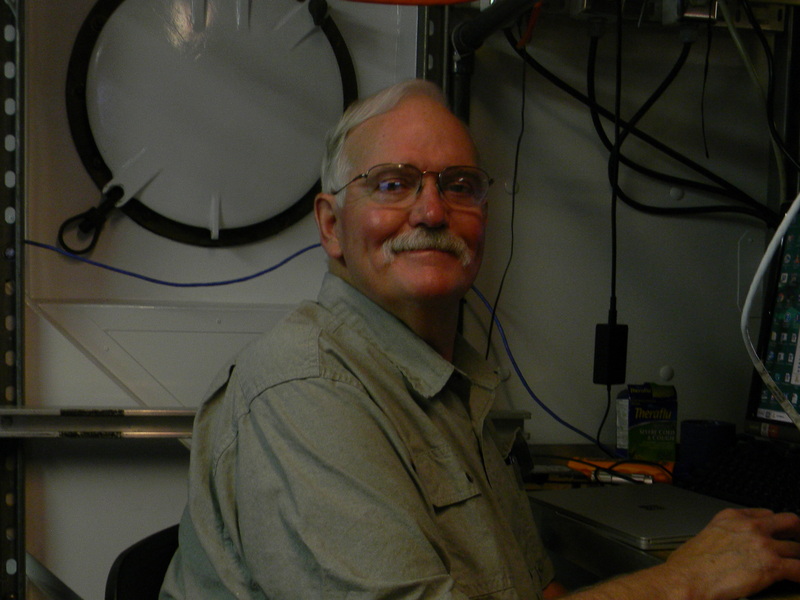 NOAA has contracted Dr. Gallager to oversee the HabCam during the annual sea scallop survey. 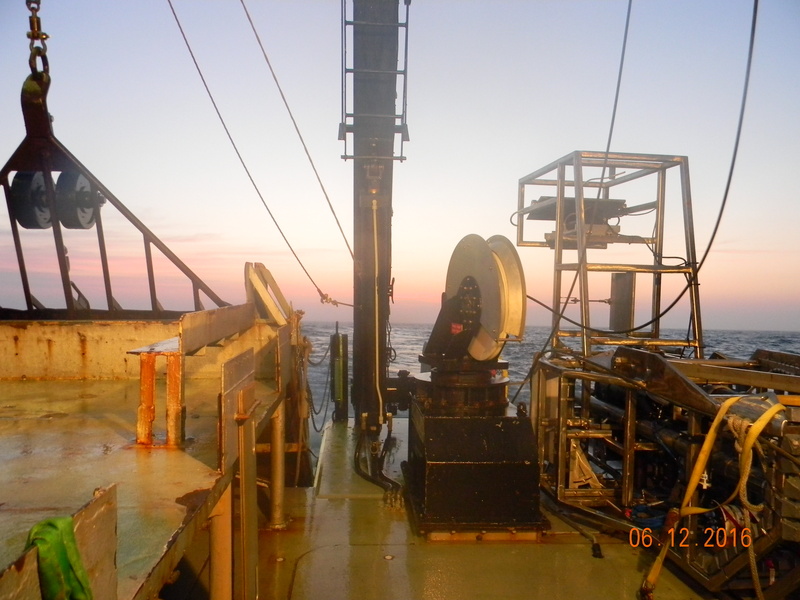 While the original HabCam is being used by the commercial fishing industry on scallop vessels, a fourth generation HabCam is used by NOAA on the R/V Sharp to help with the annual Atlantic scallop survey. It has two sonar devices, one forward and one rear sonar scans a 50 meter swath on each side of the vehicle. It is equipped with four strobe lights that allow two cameras to take photographs. Each camera takes six pictures a second. 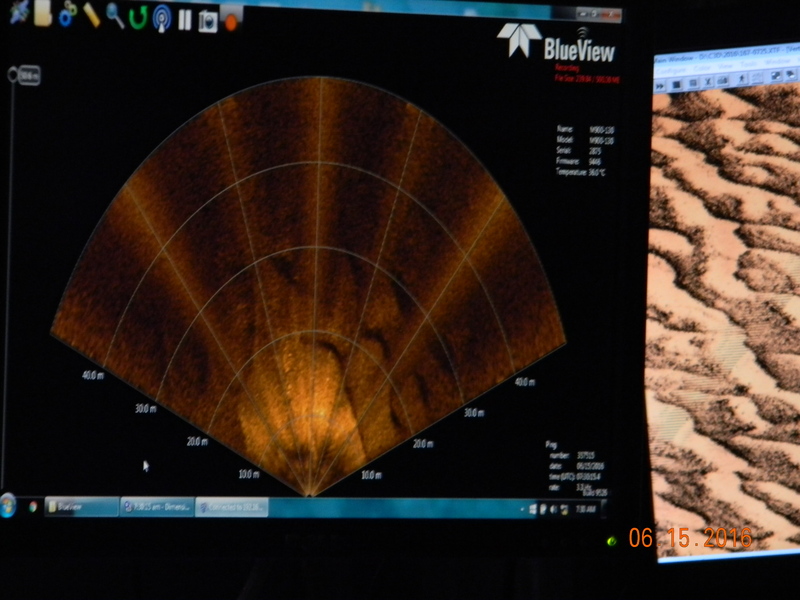 The HabCam has a sensor called the CTD (Conductivity, Temperature, Depth) to measure physical properties such as salinity, temperature, depth, and dissolved oxygen. Two other sensors are used to measure turbidity, and a device that measures the scattering and absorption of light at that depth. Measuring absorption allows the computer to make color corrections on the pictures so the true colors of the habitat are seen. The vehicle is 3700 lbs. and made of stainless steel. It is actually towed through the water but is “driven” by using the metal jacketed fiber-optic tow cable which pulls it through the water. The HabCam relays the real-time images and data directly to the ship where it is processed by computers and also people monitoring the pictures. Computer Vision and Image Processing tools are also being developed to count and size scallops automatically from the images as the vehicle is being towed. This will allow managers in the future to use adaptive sampling approaches whereby the sampling track is actually changed as the vehicle is towed to optimize the survey. By analyzing the data from the HabCam and doing dredges over mapped areas of the ocean, scientists can relay their findings to fisherman with suggestions on the best places to harvest Atlantic sea scallops. It is important to keep in mind the other animals in the area that may be affected by scallop fishing. The Yellowtail flounder is one such animals that could be better monitored with the aid of the HabCam. The flounder often is found living in areas that have a high density of sea scallops, but by identifying areas of high scallop and low yellowtail densities, fishermen may be better able to avoid yellowtail bycatch. Unfortunately, many bycatch fish do not survive the dredging and are often dead upon being returned to the sea. While scallops and fish are certainly important to the commercial fishing industry, understanding the habitat that supports these organisms is paramount to their effective management. HabCam collects images that contain a huge amount of information on habitat factors such as temperature, salinity, chlorophyll, seafloor roughness, and substrate type (mud, sand, gravel, shells, boulders, etc). Habitat for one organism is not necessarily the same for the next so we need to put together maps of where certain habitats allow each species to exist and where they co-exist to form communities. Understanding this, we can simulate how communities will respond to climate change and other changing environmental factors such as Ocean Acidification (i.e., low ph), which all contribute to habitat. Because of the success of the HabCam and other habitat monitoring/mapping devices, HabCams I – VI have been built. There are four different vehicles used now for specialized data collection depending on what the survey priorities are. HabCam is a unique, and high-end technology, but at the same time is being upgraded to provide habitat data on a variety of sampling platforms such as high speed torpedo-like systems that are towed at 10 kts or greater and on robotic Autonomous Underwater Vehicles (AUV) that will carry the stereo cameras and sonar systems currently on HabCam. 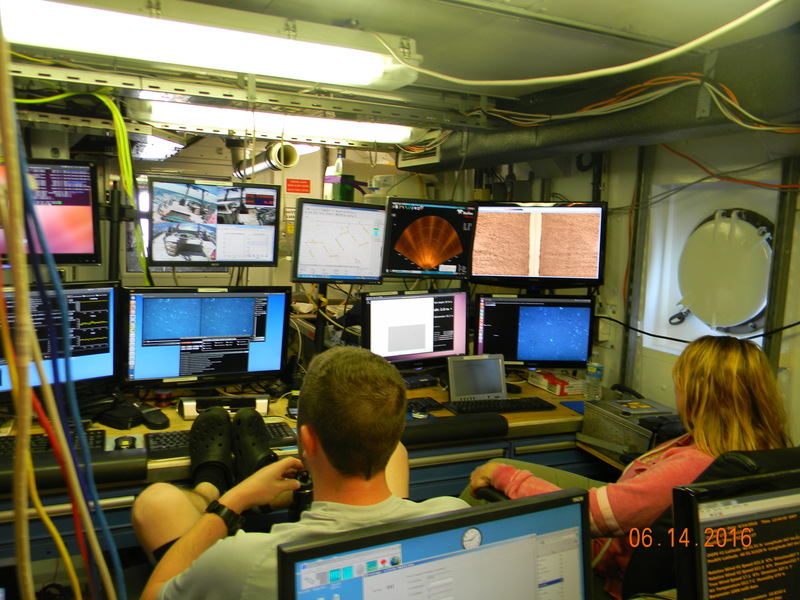 The combination of robotics with underwater sampling provides a window into the ocean universe that humans have not been able to effectively explore and sample because of the great pressure and low temperature of the deep sea. 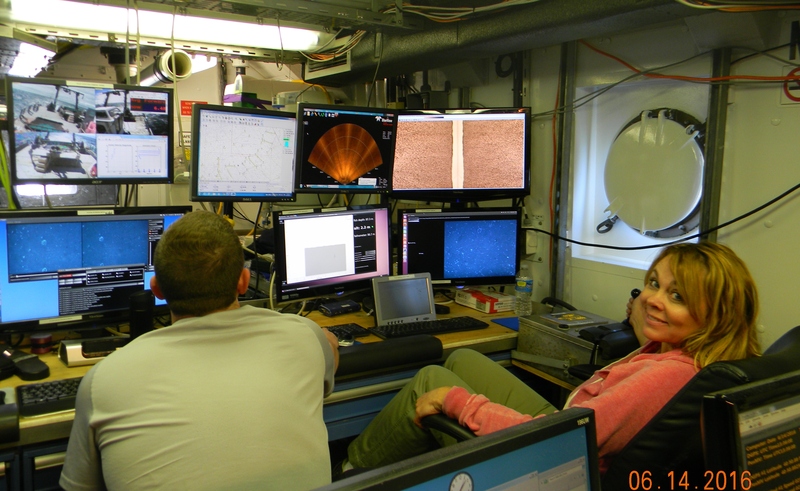 Abyssal habitat (deeper than 3000m) is very difficult to sample and more and more oceanographers are looking to develop and use robots to get to where observations and samples need to be taken. While the HabCam was initially developed for the scallop fishing industry, it has clearly made an invaluable contribution to the study of habitats that have so long been inaccessible to us. There are many cameras throughout the world used to take pictures of the ocean bottom and even animals therein, but the HabCam series that was developed out of Woods Hole Oceanographic Institution (WHOI) is integrating many different data types to develop a more comprehensive understanding of fauna and flora (animals and plants) in their habitats worldwide. 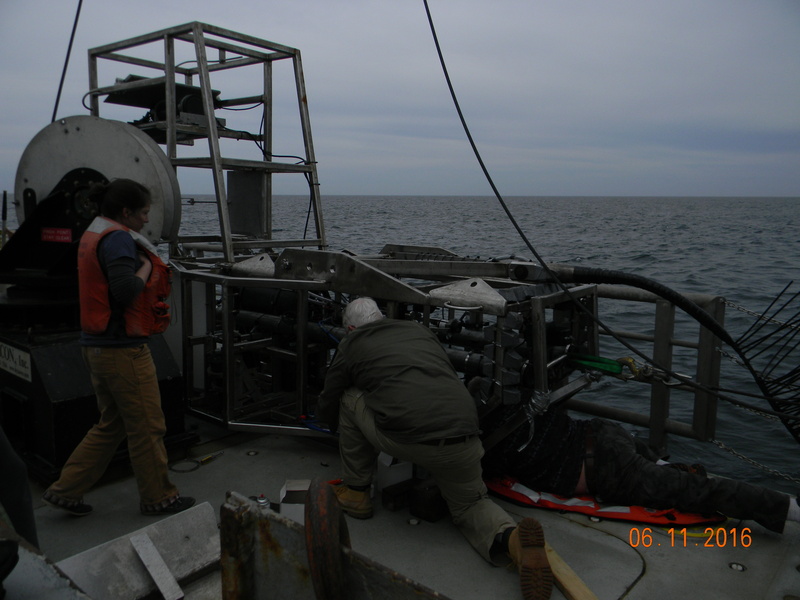 It is an exciting time for oceanic research! Dr. Scott Gallager PhD, tenured Associate Scientist, Biology Department, Woods Hole Oceanographic Institution, Woods Hole, MA, Visiting Professor, Okinawa Institute of Science and Technology, Okinawa, Japan. I am feeling great and meeting so many fascinating people! Dr. Gallager, or Scott to the scientists on board, has taught me so much in the very short time I’ve been on the ship. He has many great stories as he has been involved in oceanic research for many years. He was asked to study the teak wood that the Titanic was made of because “Bob” Ballard saw so little of it even though all the decks and ornamentations were made of it. 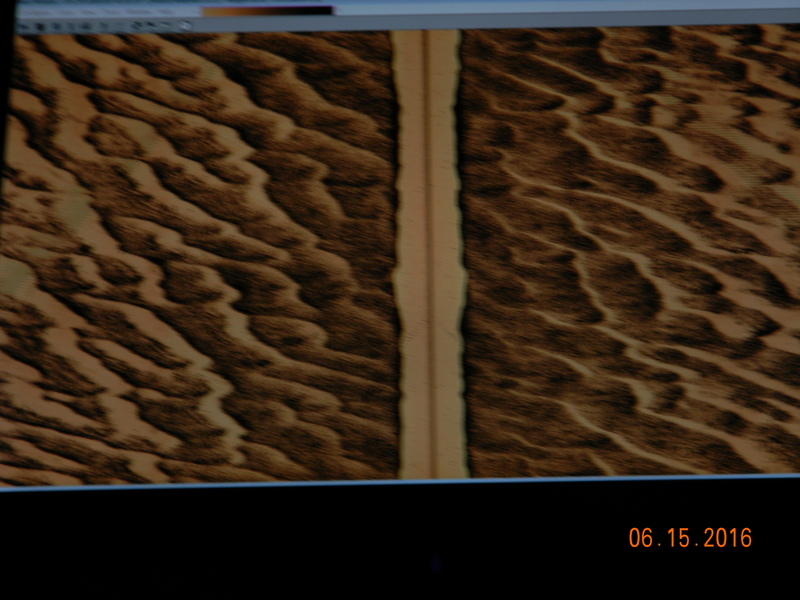 So Bob asked Scott to study it and Scott wrote a paper on the polychaete worm that was able to break down the tough cellulose tissue. After our dredging yesterday resulted in many scallops, you will never guess what we are having for our 12:00 p.m. meal. I said 12:00 p.m. meal because for some of us it is breakfast and for others it is supper. 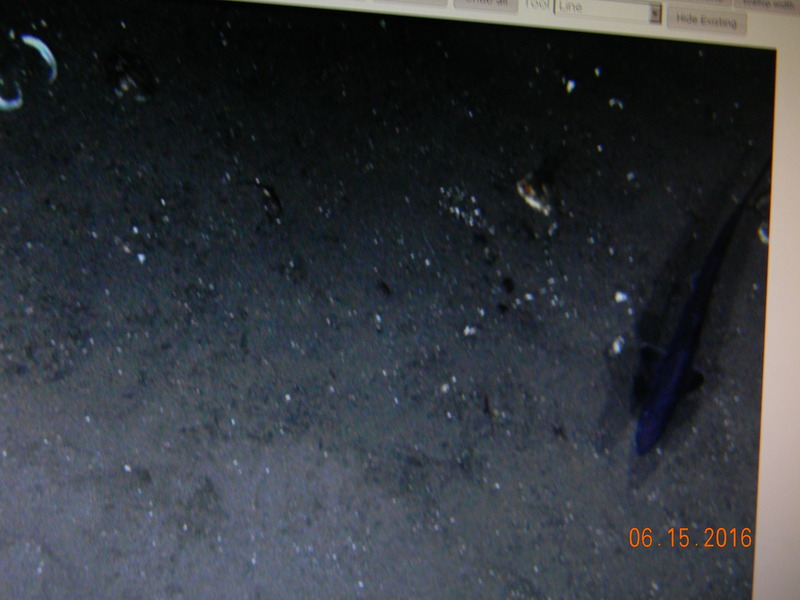 Dogfish on the bottom of the ocean, Picture taken by the Habcam. Skate on the bottom of the ocean. Picture taken by the HabCam. 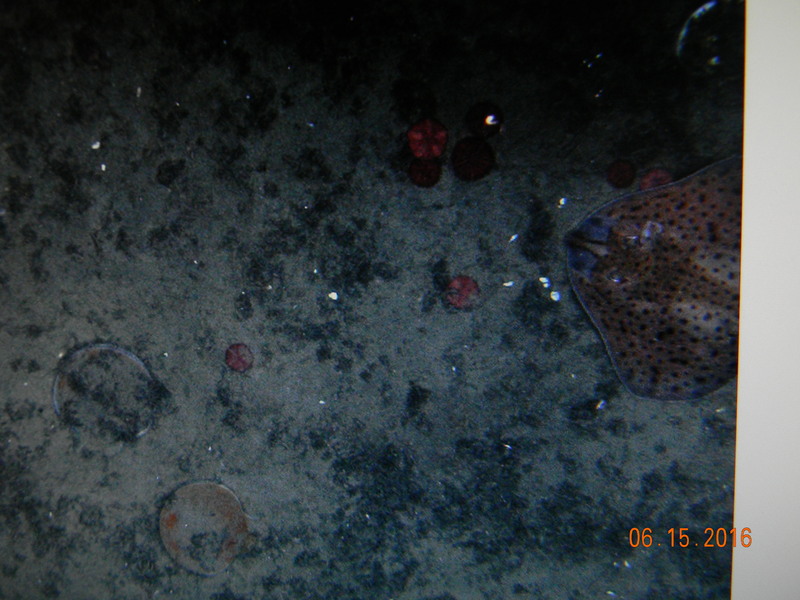 This entry was posted in 2016, Donna Knutson 2016, NOAA Teacher at Sea and tagged HabCam, R/V Hugh R. Sharp, scallop, scallop research, University of Delaware. Bookmark the permalink. Hi! You will either end this experience having scallops as your favorite food in the world…or you may never eat another one in your life! Thanks for sharing! Hello!! Scallops are much tastier here. I’ve got some good recipes now. Yesterday I got some practice shucking. Fun!